A chest tube is a hollow, flexible tube placed into the chest. It acts as a drain. 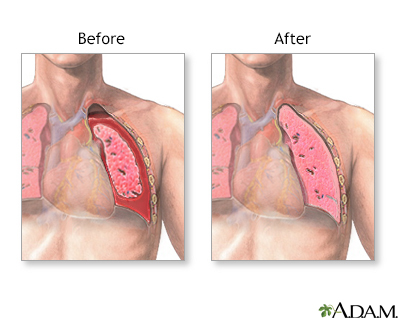 Chest tubes drain blood, fluid, or air from around your lungs, heart, or esophagus. The tube around your lung is placed between your ribs and into the space between the inner lining and the outer lining of your chest cavity. 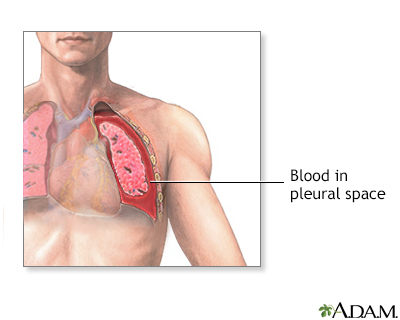 This is called the pleural space. It is done to allow your lungs to fully expand. When your chest tube is inserted, you will lie on your side or sit partly upright, with one arm over your head. Sometimes, you will receive medicine through a vein (intravenous, or IV) to make you relaxed and sleepy. Your skin will be cleaned at the site of the planned insertion. The chest tube is inserted through a 1-inch (2.5 centimeters) cut in your skin between your ribs. Then it is guided to the correct spot. The tube is connected to a special canister. Suction is often used to help it drain. Other times, gravity alone will allow it to drain. A stitch (suture) and tape keep the tube in place. After your chest tube insertion, you will have a chest x-ray to make sure the tube is in the right place. The chest tube most often stays in place until x-rays show that all the blood, fluid, or air has drained from your chest and your lung has fully re-expanded. The tube is easy to remove when it is no longer needed. Some people may have a chest tube inserted that is guided by x-ray, computerized tomography (CT), or ultrasound. If you have major lung or heart surgery, a chest tube will be placed while you are under general anesthesia (asleep) during your surgery. You will most likely stay in the hospital until your chest tube is removed. In some cases, a person may go home with a chest tube. While the chest tube is in place, your health care provider will carefully check for air leaks, breathing problems, and if you need oxygen. They will also make sure the tube stays in place. Your provider will tell you whether it is OK to get up and walk around or sit in a chair. Breathe deeply and cough often (your nurse will teach you how to do this). Deep breathing and coughing will help re-expand your lung and help with drainage. Be careful there are no kinks in your tube. The drainage system should always sit upright and be placed below your lungs. If it is not, the fluid or air will not drain and your lungs can't re-expand. Your chest tube comes out or shifts. You suddenly have a harder time breathing or have more pain. The outlook depends on the reason a chest tube is inserted. Pneumothorax most often improves, but sometimes surgery is needed to correct the underlying problem. This may be performed through a scope or may require a large incision depending on your underlying condition. 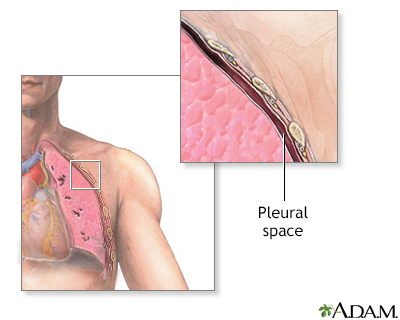 In cases of infection, the person improves when the infection is treated, although scarring of the lining of the lung can sometimes occur (fibrothorax). This may require surgery to correct the problem. 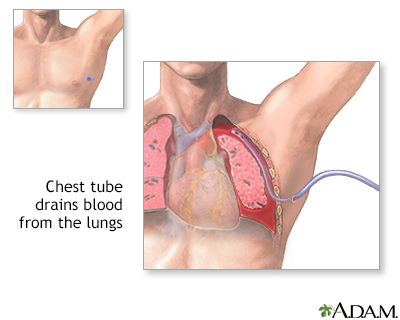 A chest tube is used to remove fluid from the space between the lungs and the wall of the chest. The tube is placed between the ribs and into the space between the inner lining and the outer lining of the lung (pleural space).